Pivo Pivo: Pizza, Burgers, Maybe Glasgow's Biggest Choice of Beers? 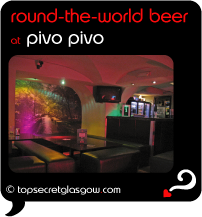 Pivo Pivo is tucked behind a small door on busy Waterloo Street, where lurks one of Glasgow's biggest choices of beer from around the world, ready to wash down a tasty, crispy pizza, juicy burger or crunchy baguette or panini. Or just refill the tank and get boosted for the next lap of your shopping trip. Great news! Finding this page means you can now join our VIP list for Pivo Pivo. Grab your very own web page all about Pivo Pivo. Do you have a special story about Pivo Pivo? A funny experience? A grand occasion? A funky photo? A personal tip? A top secret?